Ceilings and roofs are often neglected and can cause a raft of follow on problems if unattended. 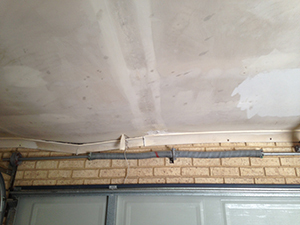 The majority of ceiling damage in Perth is caused by storms or simply building age. Over time our home ceilings can start to leak and sag and it is important that these issues are rectified before structural damage occurs. We specialise in all repairs of sagging or damaged ceilings whether they are gyprock ceilings, plaster-glass ceilings, hardiflex or lathe and plaster. We prop them up, we re-screw them right back to the ceiling joists and we patch neatly over the screw holes. Then we sand the lot down. Our electric sander is connected to a heavy duty vacuum cleaner. 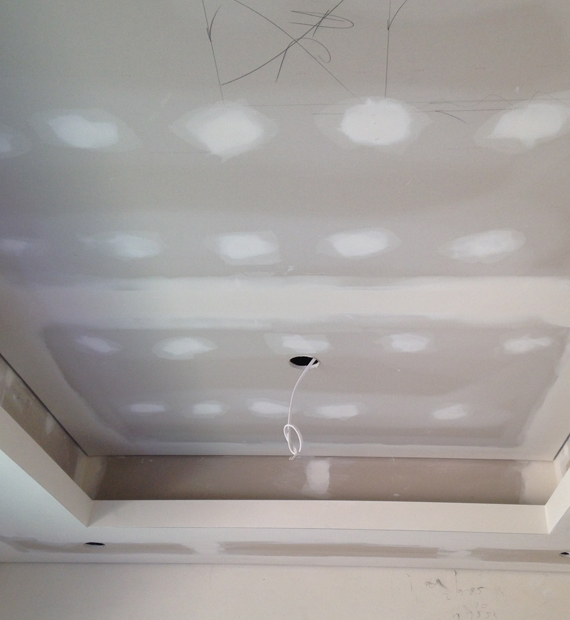 When we finish, the ceilings are ready to paint. 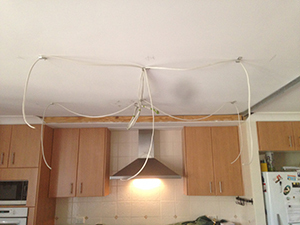 If the ceilings are badly damaged, we pull them down and replace them. Painting and Decorating: Many people are too busy to paint their walls or their ceilings once we have finished and they ask us to proceed with the painting. Commonly caused by water damage from rain, sagging ceilings can get worse over time and become a safety issue for your family. Repairing a sagging ceiling should only be done by experienced experts as it is important to ensure that the roof structure is still sound. 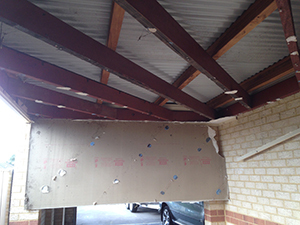 The ceiling itself needs to carefully removed in sections and the supporting walls and roof structure repaired. Once the supporting structures are repaired and the cause of the issue solved, we then systematically rebuild your interior ceiling matching the original design and integrating any existing cornices. Floating Bulkheads are a bulkhead that is separate from a wall or ceiling. For example, you have your main ceiling, and then have a floating bulkhead suspended underneath the ceiling with the option of lights coming from above the bulkhead giving a halo effect. Suspended ceilings give you the opportunity to hide all the electrical wires in your roof, the ducted air conditioning systems and computer wiring, however these are still as susceptible to damage or age related wear.
" I am truly pleased and impressed with your company and your employees. I will not hesitate to recommend your company to anyone looking for ceiling work "
" I wanted to take a moment to compliment your company on the very professional job they did at our home the other week. I have already recommended the Wall and Ceiling Doctor to two of my neighbours who are considering having some work done "
As one of the most experienced and well respected ceiling companies in Western Australia you know that you are in good hands. We place a priority in offering our customers quality workmanship using industry leading products and honest customer service that you deserve. The Wall & Ceiling Doctor team offers a free onsite quote through all areas of Perth.